Today March 30, 2016, lawyers of the compas Mónica Caballero and Francisco Solar were notified that the sentence of the High Court condemns the anarchists to 5 years in prison on charges of “injury”, plus 7 years for “damage with terrorist purpose”, with a total of 12 years in prison for each of them. They were acquitted of the charges of “belonging to a terrorist organization and conspiracy” against the Monastery of Montserrat. Facing the condemnation of our comrades we have the challenge of extend the struggle and solidarity, to defend our ties and our ideas, to deny that their world is reduced to the four walls that keep them locked up. There is no “inside”, nor is there an “outside”, there are only enemies against the state and all authority. Also see reports for days 1 & 2. Today, Thursday, March 10, the third and final hearing in the trial of our comrades Mónica and Francisco took place. There was mainly the summing up of the lawyers for both the defence and the prosecution, and that of the Public Prosecutor. The hearing began with the expert witnesses called by the defence, who submitted reports on the comparative study of DNA from a number of objects found after the explosion, and DNA of Francisco and Mónica extracted from objects taken from their cells. They confirmed what had already been exposed in the reports: there is absolutely no correspondence. In active solidarity with our comrades Francisco Solar and Monica Caballero, anarchist prisoners in Spanish state jails. From the high security prison of Santiago, Chile, we make an international call for active solidarity with Francisco and Monica, who soon will face the legal farce of the Spanish State. 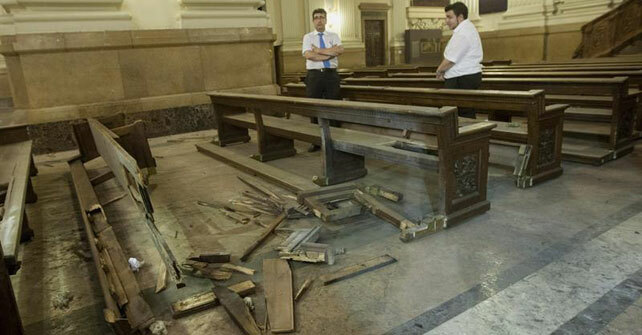 They are accused of being part of Insurreccional Commando Mateo Morral who have claimed responsibility for two explosive attacks on historic symbols [1, 2] of the Spanish Catholic church in the course of the year 2013. On the next 8, 9 and 10 March, the trial in the National Court in Madrid is determined to perform an exemplary punishment on the lives of our comrades. squatted place that has existed for 25 years. organisation with terrorist goals and a violent anarchist character”. We have demonstrated that your sanctified dens are vulnerable. The foundations of your Power have trembled by the kilos of our sacrilegious gunpowder, seeking a breach of your civic peace that has been based upon killings and persons locked up for years in the slammer. This is revenge. We have overcome the barrier of fear. The target of the explosive attack is clear; to strike the Bourbon monarchy in their sacred sites. All their majestuosity is the fruit of oppression, and we, the oppressed, will end with it through insurrectional revolutionary violence. We won’t fall into the trap of waiting to be given the historical conditions. We believe that the conditions are propitious for attack as long as State, Capital and especially a rotten fascist royal family exist. We are determined. We do not wait. We act. We do not hold the mistaken idea that we will achieve the destruction of all that oppresses us solely through actions such as this one. We are not fooling ourselves. We are not granting ourselves self-complacency. This is propaganda by the deed, which has existed for more than a century among the seditious and conspirators against Power. It is an appeal to war without limits using all our imagination and energy to end with this rotten world.